Since I have started writing & doing presentations on Columnstore Indexes there have been a number of questions on the same topic – Statistics. I have skipped some of the Columnstore Indexes basics since I have assumed that there were enough presentations and information on the internet on this topic, but since this question simply does not go away – I decided to include it into the series. A unit of read & write operation in Columnstore Indexes for SQL Server 2014 is a segment, with all the Pages & Extends that it includes, which means that no matter if we are reading 1 row or 1045678 rows, we shall need to read each 8K page that this Segments consists off. The number of reads will not correspond 1 or 2 or 3 Pages, but the whole Segment. How does Segment Elimination works ? This is why for each of the columns in each and every table we have a statistics object, we also have statistics objects for the indexes whenever we create them. Because for Columnstore Indexes a unit of any operation is a Segment and we already have minimum & maximum values we can decide if one particular Segment should be scanned or not. There is no Columnstore Index Seek operation, because at the current version of the SQL Server (2014) does not support seek, whenever we touch Columnstore Index Segment we scan it completely for the searched information. 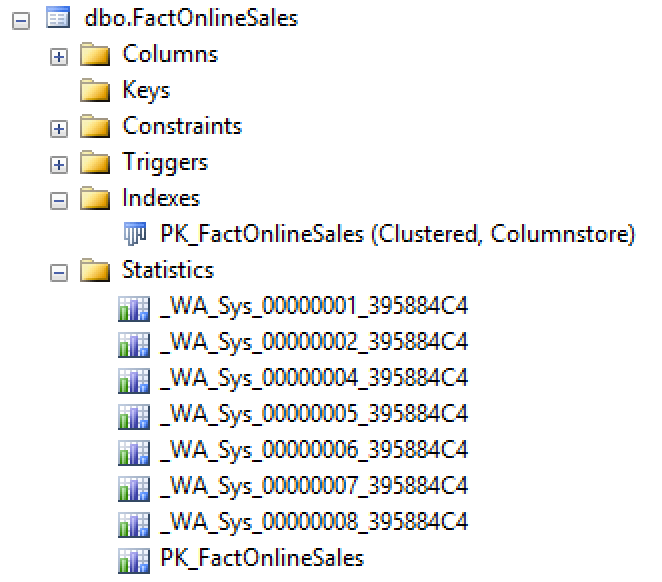 Because there is no support for the statistics for the Columnstore Indexes objects. We have processed 12.627.608 Rows while scanning the table, but somehow and somewhere we have managed to estimate that the total size of the table shall be 12.627.600 rows, having a difference of just 8 rows with the actual number. Notice, that I have got pretty good close number, even though I am convinced that in the reality the formula for the calculation should be extremely complex with a some important inclusions of Delta-Stores and Deleted Bitmaps. In SQL Server 2014 we have received a new Cardinality Estimator and if you check the restore DB script you will notice that I have updated the compatibility mode to 120, automatically enabling the new Cardinality Estimator for my Database. 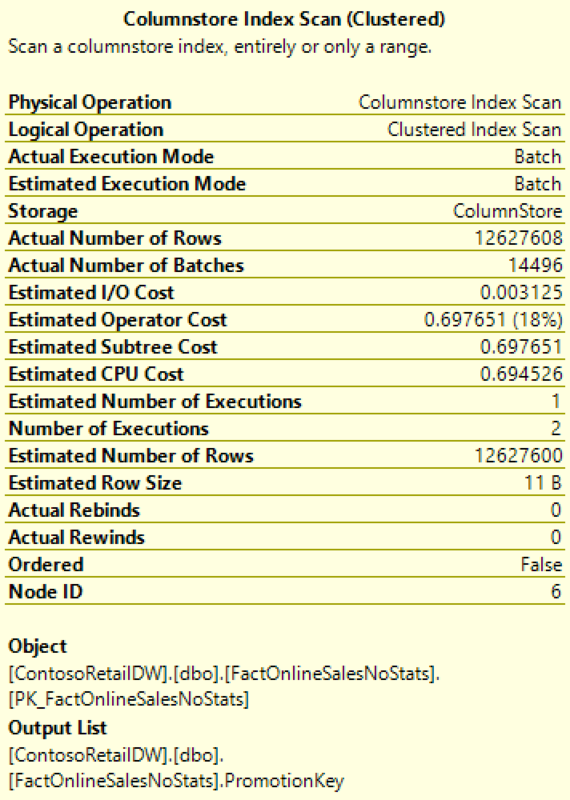 The resulting execution plan is almost exactly the same, the major difference here is that the predicate is getting pushed down to the Columnstore Index Scan. The interesting part here is the number of rows that the Cardinality Estimator is expecting to get – 3353.53. Still the same situation, still the same number 3353.53 even though this time we have really got a lot of data to process – 4.134.535 rows actually. And what if I go and select a datetime column? 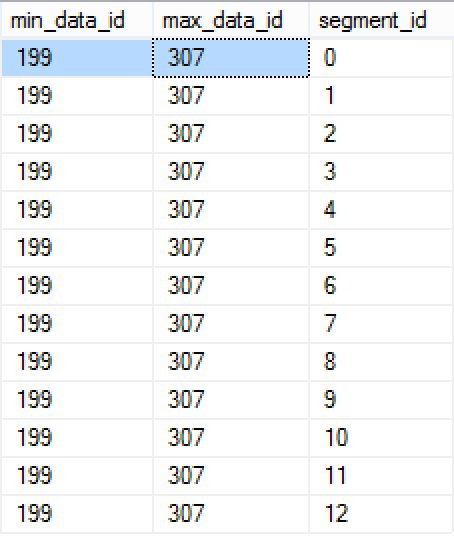 No changes, it is all about the same “magic” number of 3353.53 estimated rows whenever I ran a query on this table with a single predicate. This query gives me 5329.93 rows as estimation, the very same number should I run 2 predicates on the OnlineSalesKey column. If we go for 3 predicates the number rises to 6218.03 rows. So this time it looks that the estimation is back to the 12.627.600 rows, as all involved Columnstore Index Segments were scanned. The plan is different, since it works in SQL Server 2012 compatibility mode for Nonclustered Columnstore Indexes, but the estimations are extremely correct – we have got just 1 row here. Running the OnlineSalesKey = 999999999 gets the same estimation, just 1 row. The difference is easy to understand and to spot: the aggregation are quite different (3rd operator from right) – Hash Match vs Stream Aggregate. As a result the first query runs just 22 ms vs 589 ms for the second one. In bigger and more complex plans the difference might go even bigger. – The statistics are still the key element in order to get a good execution plan. For the current 2 releases – SQL Server 2012 and SQL Server 2014, for Columnstore Indexes – statistics do not affect the data access operations. Your article starts with the statement that columnstore indexes don’t use statistics because they don’t need them. But later in the article you prove this statement wrong. 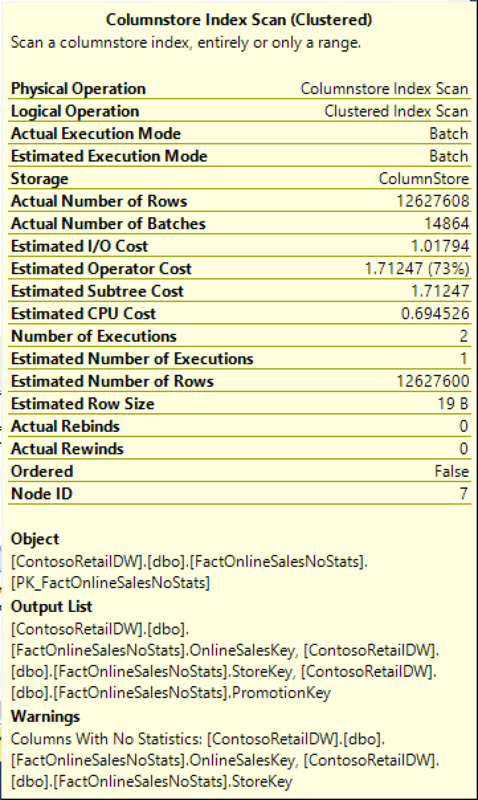 For instance in the query with a filter on the StoreKey column, where the actual number of rows is over 1000 times more than the estimate. With statistics, a better estimate would have been made, as you will see when you run the same query on the original FactOnlineSales table. This will not impact the scan of the columnstore index itself, but it may have a major impact on the rest of the plan if this is just a part of a more complicated query. For instance, a sort, hash match aggregate, or hash match join may have an insufficient memory grant, causing expensive spills to tempdb. (Luckily, SQL Server *does* actually create and use statistics, even for columnstore indexes, as I accidentally found out when I tried to reproduce your scripts but had forgotten to run the script that explicitly disables statistics creation – after running a few queries, I had several automamtically created statistics, and I got fairly accurate estimates in my plans). (Also, the warning you got in one of your plans hints about exactly that – it warns you about two columns with no statistics, which the optimizer does not like). I focused on the Columnstore Index Scan and really did not looked with attention at what other iterators might get affected. Even some simple plans differ on the aggregate operations when having statistics. I have observed that UPDATE STATISTICS on a CLUSTERED COLUMNSTORE seems to run as MAXDOP 1 whereas on a row store table it goes parallel. Is this something you have experienced?